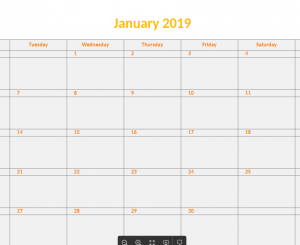 No more hassle when it comes to planning, the 2019 Monthly Calendar Template has you covered from every angle. The simple, yet efficient, calendar template was designed for you to write down all your plans as fast as humanly possible. You probably have a lot on your plate; this template is just here to help you clear that plate quickly. Nothing beats the pure simplicity of a calendar. Just write down all your scheduled plans, events, and assignments onto this template and you’ll know exactly where you need to be every day of the month. So what are you waiting for? This template is quick, efficient, and best of all, it’s free! Start by downloading the free document to your computer. Click the link located at the bottom of the page to begin the downloading process. Once you have the document open, you’ll be able to choose the month from the list of tabs at the bottom of your screen. Click on the current month to begin editing the document. Next, you’ll want to write down any important plans or tasks that need to be accomplished during this month. Simply choose the box representing the day your task is due and write a brief description by clicking inside the box and typing a new item. Once you press enter, the item will be set into the box! There is also a convenient section at the bottom of each Monthly Calendar table. You can utilize this space to leave yourself general notes for the month. When you’re ready to move onto the next month, simply click the proceeding tab at the bottom of your screen. If you want to print a particular month, simply press the “File” tab up at the top and select “Print”. You can choose “Save As” instead to save the document somewhere on your computer for later use. By taking the time to write down your plans, you will gain the organizational skills to succeed in any task life may throw your way. This template is fast, free, and easy to use. Don’t waste any more time trying to remember or write down bits and pieces of your schedule on a piece of paper. You can everything available on one simple document today!